Daryll Cullinan during commentary in the first Test at Nagpur brought out an interesting statistic and shared it with L. Sivaramakrishnan and asked the former India leg spinner what he thought about it. Cullinan said that when Ricky Ponting scored his first Test hundred Sachin Tendulkar had 11 and since then Ponting has scored 38 hundreds while Tendulkar has made 35 (now 36) so who do you think is the better batsman. Interestingly Cullinan did not say anything explicitly but made his choice apparent by his line of questioning in which he challenged the assertion of Siva, who picked Tendulkar, by things like match-winning knocks and scores on bowling-friendly wickets and performance in big matches etc. It is essentially a subjective judgement, with all due respect to statistics, but one can use facts to build an argument like Cullinan did. I’ll pick the Test Cullinan spoke about, where Tendulkar got his 11th Test match hundred, and use a way different to the one he used to make a comparison. It was a Test match that started on January 2, 1997 and Cullinan played in that game which South Africa won by 282 runs at Cape Town. Tendulkar was a ‘23-year-old veteran’ and the captain of his team and he made 169; an innings that began in complete crisis and helped India avoid a follow on after SA had put 529 on board. 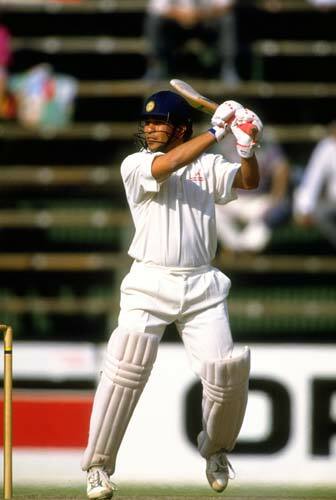 After the Cape Town Test, Tendulkar had 3284 runs in 47 Tests (72 innings) at an average of 50.52 with 11 hundreds and 15 fifties and 179 as his highest score. At the same juncture of 47 Tests (74 innings) Ricky Ponting had 2830 runs at 42.87 with 8 hundreds and 14 fifties and 197 as his highest score. The age is an important issue here and Ponting was just a month or so shy of being 21 when he made his debut while Tendulkar was 16-and-a-half. Why is age an issue? At 21, the body of an athlete is better prepared for the rigours of international cricket and at 16 it is more vulnerable to them. My point here is not destiny but the simple observation that cricket at the junior level is organised age-wise, unless someone is exceptionally-talented—a 22-year-old, in all likelihood, would hammer the attack if clubbed with the under-16 team. Shouldn’t the first 47 Tests of the career of Tendulkar, where he grew from being 16 plus to 23 plus, compare unfavourably with the first 47 Tests of Ponting, where Ponting grew from almost 21 to around 27? The records present a totally-different picture. Tendulkar took only a couple of seasons to dazzle like an exquisite, polished and rare diamond; a Kohinoor. And he got world-wide recognition early in his career. It is difficult to choose between Brian Lara and Tendulkar as they are both natural and brilliant in their own way. Ponting was a late bloomer and an average player till as late as about the end of 2001 and it was only in 2002 that his batting started to flower. In 2004 Tendulkar had a freak injury and then another one and he went under the knife twice and that cost him the better part of three seasons—the comparison started only when Ponting began scaling the Everest and Tendulkar began falling in a bottomless gorge. Coming back to international cricket after lengthy breaks and to get going again is a very demanding task and though Tendulkar found his mojo in 50-over cricket he looked a pale shadow of his former self in the Test matches. The rub of the green also went against him a few times and on one rare fluent day he got a howler from Steve Bucknor at the Eden Gardens; he had got a reprieve in the previous match in Mohali so it did even out in that sense. What caused Tendulkar and his fans the anguish was the fact that he was getting his rhythm going after a long period? There was an outcry in India with the 2003 decision that Bucknor gave in Brisbane also boomeranging. A newspaper summed up the mood with a big bold headline saying ‘BUCKNORED’. Lismore, on the far north hippie trail of New South Wales, was the strange location for Tendulkar’s maiden first-class innings in Australia. Lismore had not seen heavy rain in months. And when the Indian team arrived on a Friday, November 1991, it poured all morning. The net session was cancelled but the three-day match began on the scheduled Saturday, November 23: “Conditions were grey overhead and green underfoot, which made predicting the ball’s flight path tricky. The bowling was top-shelf—Whitney, Lawson, Holdsworth, Matthews, Waugh, Waugh—and the batting a little gormless, all except for the one who was 18. What would be the position of Cullinan if asked to comment on whether Australia had the best bowling attack for the better part of two decades; an attack having phenomenal bite. It is an answer that Ponting can’t give because for no fault of his he never had to face up to them. For that answer we can look at Tendulkar; and much as I hate doing this at Cullinan as well. Cullinan has a batting average of 12.75 against Australia and against Australia in Australia it further dips to 4.42 with 10 as his highest score. Harbhajan Singh has a better record than that with four fifties and an average of 21.83 against the Aussies; Cullinan missed having a fifty against the Aussies by 3 runs. The Aussie attack had his number and was just too good for him. The first time he came up against them Craig McDermott nailed him for a duck; the same McDermott who told South African fast bowler Allan Donald that Tendulkar was going to be the best. And the same Donald who first bowled at Tendulkar in an ODI at the Eden Gardens and said that it was blatantly clear (Tendulkar made 60 plus) that he was going to be a player to remember. “He is No. 1 in my book—the best player I have ever had the privilege of bowling to. There’s Steve Waugh and there’s Brian Lara, who was wonderful in 1995, but Tendulkar is a class above, consistently special,” Donald said. Sachin Tendulkar averages 56.08 against Australia with 10 hundreds and 11 fifties; and against Australia in Australia his average goes up to 58.53. The bowler who tormented Cullinan the most admitted to having nightmares about Tendulkar stepping out and hitting him for a six over his head from the rough outside the leg stump on wickets suited for spin bowling. On the instinct of Tendulkar, Ryan wrote: “Every bolt and screw in the Tendulkar technique seemed put there to aid the getting of runs. Tendulkar was a run-getting machine, except no machine could also be so graceful—or instinctive, for that’s what it was, instinct, which told him that the way to bat was to attack. He didn’t learn this. He knew it, inside himself. Runs were what counted. Tendulkar now is a batting sage. To see him build an innings brick by brick, by keeping the good balls out and dispatching the bad ones to the boundary, is a deep and fulfilling joy that no amount of slam bam cricket can give. He is solid in defence but not dour; that phase where he just hung around and looked purposeless is long gone. In the 50-over game he can still play the innings of a lifetime. Just look at his masterful performances after the 2007 World Cup; after six scores in the nineties he broke the jinx by an unbeaten match-winning 117 in the first Commonwealth Bank Series final in Sydney while chasing and made 91 in the second final at Brisbane to beat Australia at home. He made 163 not out and left the crease when he had a chance to get to a double hundred against New Zealand as he did not want to take a chance with a minor niggle flaring up before the Test matches. Then he made 138 in a final against Sri Lanka in Colombo. Four match-winning knocks and three of them in tournament finals but it didn’t stop there and he produced another magical innings of 175 against Australia in Hyderabad that almost single-handedly carried India to the mammoth target of 350 and with a little more support it was an innings that would have seen India through. Sunil Gavaskar, the other genius in the history of Indian batting, described how Tendulkar just practised the cradle movement on the morning India was to bat at the Eden Gardens; just the forward and back foot defence. Just that. Apart from the brief period, where physical injuries perhaps hampered the ‘psychological’ approach of Tendulkar, scoring runs comes as naturally to him as maternal affection to a new mother. Ricky Ponting, the best exponent of the pull shot, has done much better in South Africa and in the middle part of this decade. Tendulkar has not had that kind of success against South Africa. The Little Master, though, is in a league of his own; a league that even the great Sir Donald Bradman didn’t mind sharing.